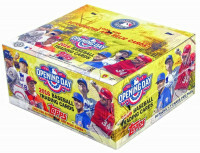 Factory Sealed 2015 Topps Update Baseball Hobby Box mit 36 Packs Per Box, 10 Cards Per Pack. 1 Autogramm oder Relic Card per Box !!! Produktinformationen "2015 Topps Update Baseball Hobby Box MLB"
Factory Sealed 2015 Topps Update Baseball Hobby Box mit 36 Packs Per Box, 10 Cards Per Pack. 1 Autogramm oder Relic Card per Box !!! Auf dem Box Cover befindet sich Kris Bryant - Chicago Cubs Superstar Rookie !! 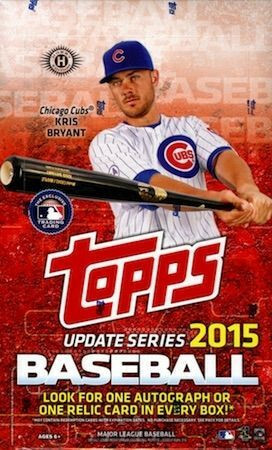 The baseball season isn't complete without Topps BASEBALL Update Series, recapping all the exciting action and electrifying players of MLB, and 2015 is no different. In fact, it's bigger and better than ever, now with 400 base cards to collect! Key Rookies: Carlos Correa, Addison Russell, Byron Buxton, Joey Gallo, Blake Swihart, Travis Shaw, Mark Canha. 400 base cards to collect, featuring all the biggest rookie call-ups, veteran transactions, and 2015 highlights! Also includes Future Stars, Rookie Debuts, MLB All-Stars, Home Run Derby, Rookie Combos, and Veteran Combos. - Gold Parallel sequentially numbered to 2015. - Snow Camo Parallel sequentially numbered to 99. - Rainbow Foil Parallel inserted 1:10. Highlight of the Year: Continuing from Series 1 & 2, the final 30 highlights are featured. Inserted 1:4. Rookie Sensatio: Cards featuring the top 25 rookie seasons of all time. Inserted 1:6. Rarities: These 15 events don't happen often, but when they do they're worth a look. Inserted 1:8. Whatever Works: 15 players and their famous superstitions. Inserted 1:8. Tape Measure Blasts: 15 of the most epic home runs of all time. Inserted 1:8. - All-Star Stitches Gold Parallel numbered to 50. - All-Star Stitches Platinum Parallel numbered 1 of 1 . All-Star Stitches Duals: 10 subject pairs. Sequentially #'d to 25. Career High Autographs: Over 30 subjects with an autograph and a career-high stat. Highlight of the Year Autographs: Up to 10 subjects. Numbered to 25. Rookie Sensations Autographs: 15 subjects. Numbered to 25. Rarities Autographs: 5 subjects. Numbered to 25. Whatever Works Autographs: 5 subjects. Numbered to 25. Tape Measure Blasts Autographs: 5 subjects. Numbered to 25. Strata Cut Signatures: 10 cut signature cards. Numbered 1/1. COMMEMORATIVE & JUMBO RELIC CARDS: 1 per Hobby Case! NEW! Etched in History: Featuring 15 record-holders with their achievement etched in metal. - Etched in History Gold Parallel numbered to 50. - Etched in History Platinum Parallel numbered to 10. -- Etched in History Platinum Parallel Autographs 5 of the above subjects with an autograph. Numbered to 10. Birth Year Coin and Stamp Cards: 10 cards featuring superstars, both active and retired, and a coin and stamp from the year of their birth. Featuring the following denominations of coin, all are sequentially numbered. - Quarter with Stamp Autographed 5 subjects with an autograph. Career High Jumbo Relics: 20 subjects featuring a jumbo relic piece. Sequentially numbered to 25. Bunt Code Cards: Supercharge your Bunt lineup with these, redeemable for coins. Weiterführende Links zu "2015 Topps Update Baseball Hobby Box MLB"
Fanbewertungen für "2015 Topps Update Baseball Hobby Box MLB"